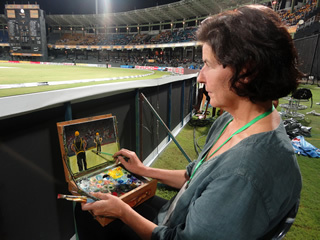 Christina Pierce was made the Official Artist for the Sri Lanka Premier League in 2012, travelling to Colombo and Kandy to paint at the side of the pitches for the tournament, working with the players, sponsors, organisers, commentators, cameramen and spectators. 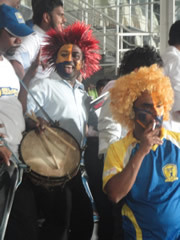 The inaugural Sri Lanka Twenty 20 Premier League (SLPL), was held at the iconic R.Premadasa International Cricket Stadium in Colombo and the picturesque Pallakele International Stadium in Kandy with many International players taking part. Similar to the Indian Premier League, with 7 provincial teams selected/franchised; each drawn from a squad of 18 players, of which 12 were Sri Lankan and the remainder, overseas players. The only major cricket countries not represented were India and England. 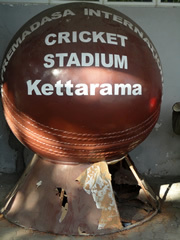 A small country of only 20 million people, recovering from a recent civil war, Sri Lanka has, during a relatively short period, fielded some of the most inspiring, innovative and exciting players, in all forms of the game, but especially in shorter forms of cricket: Muralitharan, Malinga, Dilshan, Jaywardene, Sangakkara ( the Wisden leading cricketer in the world 2011) and many others. 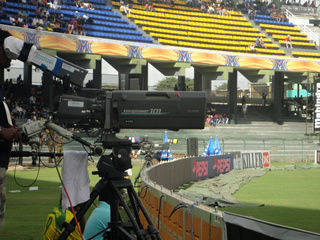 The tournament was broadcast live to most of the cricket playing nations with particular interest being shown in India, Pakistan, Sri Lanka and the Far East. 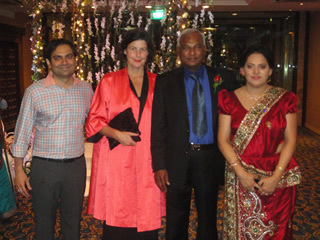 Click here to see the press cuttings.